Growing herbs together is both economical and convenient. Most herbs thrive among other varieties, as long as as the herbs you group have the same environmental growing needs. Design your herb garden with a theme, or because certain herbs grown next to one another will thrive together. 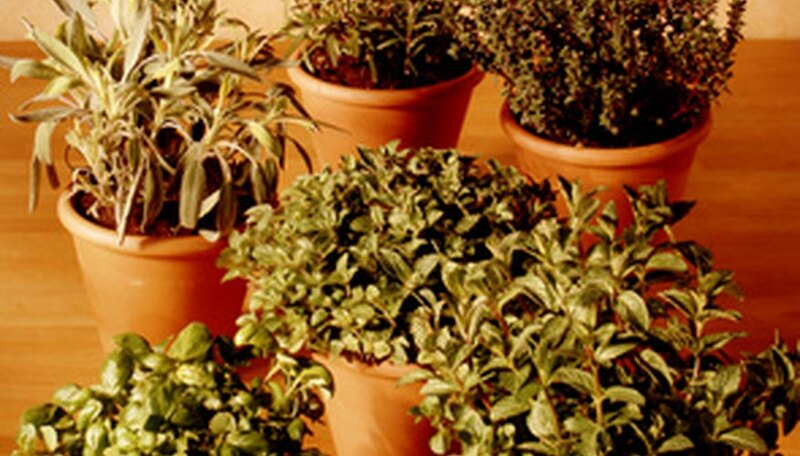 A few herbs should not be planted near other herbs because of detrimental influences. Both rue and fennel tend to inhibit the growth of nearby herbs, particularly basil. Fennel affects a wider range of herbs, and may kill herb plants close by, so you should plan to grow fennel by itself. Designing and planting a themed herb garden can help you determine what herbs to plant together. Many gardeners choose their herbs based on a favorite cuisine. An Italian herb theme of basil, parsley, oregano, rosemary, thyme, marjoram, fennel, sage and savory is extremely popular. Using herbs from your Italian herb garden will add a fresh, intense flavor to tomato sauce, Italian bread, pizza dough and toppings. At the end of the growing season, you can harvest and dry the leaves from your herbs for an ample supply throughout the winter. French herbs like lavender, tarragon, sorrel, thyme, fennel, rosemary, parsley, oregano, savory, marjoram and chives are often used fresh to make French cuisine, creating the renowned taste and flavor the French are known for. All these herbs are easy to grow in your own French-themed herb garden. Many of the fragrant herbs in a French herb garden can also be used for potpourri. Some simply want to have an array of herbs that are commonly used in the kitchen. Generally referred to as a chef's kitchen grouping, these herb gardens include chives, garlic, parsley, oregano, tarragon, thyme, basil, marjoram, savory, rosemary, sage and assorted mints. Medicinal or healing herb gardens are becoming more popular. Common herbs known for their health benefits are chamomile, catnip, yarrow, feverfew, comfrey, hyssop, mints, lavender, echinacea, St. John’s wort, thyme and valerian. Plant herbs for a tea garden by using a variety of mints, lemon balm, bee balm, chamomile, lemon verbena, different flavored thymes and lavender. Harvest the leaves and flowers, and use them fresh by placing the leaves in your teapot then pouring boiling water over them to steep. You can also dry the herbs for later use in a tea ball. Herbs are known to benefit vegetables and flowers when they're grown together in a garden, mostly because the herb either draws beneficial insects or wards off pests. Many herbs also grow better when they are planted together. Parsley and chives or sage and rosemary do better when grown together, as does chervil when planted with dill and coriander. Germination is faster for anise and coriander seeds that are sown together.